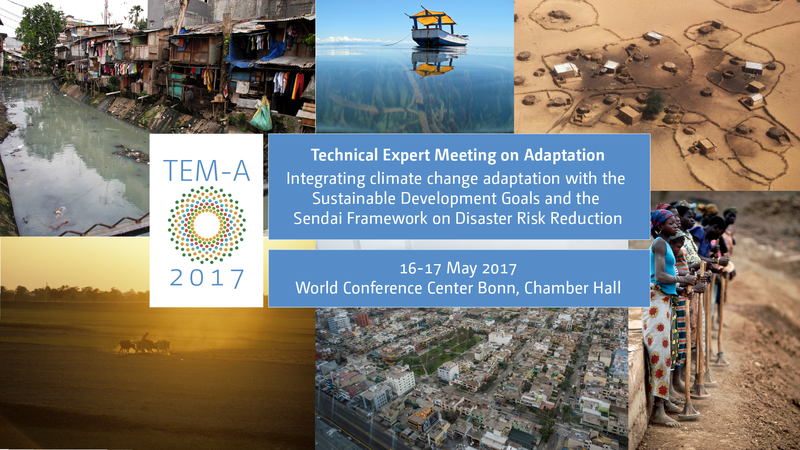 From 16-17 May 2017, an expert meeting on adaptation will take place on the margins of the UN Climate Change Conference in Bonn, Germany. Participants will identify opportunities for jointly advancing adaptation to climate change, the Sustainable Development Goals (SDGs) and disaster risk reduction. National adaptation plans (NAPs) will be highlighted as avenues through which countries can successfully pursue their adaptation, disaster risk and development efforts. The meeting will be highly participatory and solutions focused. It will involve the Executive Secretary Ms. Patricia Espinosa, the High-Level Climate Champion from Morocco, H.E. Hakima El Haite, H.E. Ambassador Deo Saran of Fiji as well as representatives from the adaptation, development and disaster risk community, national policy-makers, experts, implementers and investors from different regions, sectors and levels. The meeting is part of a broader process on adaptation established in Paris to enhance climate action prior to 2020. This process for the first time seeks to officially bring the voices of the private sector, civil society and other relevant stakeholders into the formal international discourse on adaptation. Key messages of the meeting will be compiled into a summary for policymakers as input to the November Climate Change Conference (COP23). They will also feed into the upcoming Global Platform for Disaster Risk Reduction in Cancun, 22-26 May 2017 and other SDG events. Participants can share their experience, success stories and engage actively to expand their network. The audience interaction tool sli.do will allow for posing of questions and participation in polls. No registration is needed. Simply visit sli.do, using your smartphone, tablet or laptop, on the day of the event with the event code #TEMA. Please note that webcast is not available.